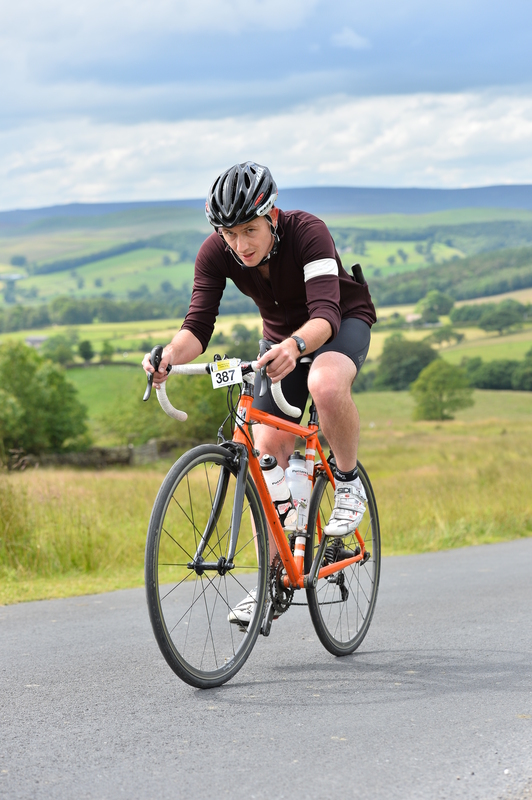 The White Rose Classic – a high time in England’s high lands. Only a few hours on from this remarkable ride and things are still coming back to me. Parts of yesterday were played out in excruciating pain, with cramping quads and calves, aching shoulders and the feeling that my head was going to burst. Parts of it were grinding, steep climbs that made a joke of cycling being a fast way to get anywhere, followed by swift, terrifying, exhilarating descents. Climbing slowly over Langbar. At least the bike looks good. The White Rose Classic is not, then, a ride to be taken lightly. I arrived full of beans from what I thought was a pretty good training programme after a string ride in the 85-mile Tour of Flanders in April. I’d also heaved a 31kg tent home on the tube from Central London on Friday and done more heavy lifting on Saturday. Perhaps I shouldn’t be overly surprised, more than anything, that I hit an upper limit of performance somewhere along this route. 3000m of climbing is 1.5 Mount Ventoux’s, the fearsome Provencal giant that repels ill-thought approaches. Yesterday the cuddly-sounding Yorkshire Dales threatened at several times to spit me out and had me seriously contemplating abandonment. Yet I didn’t, so hurrah for the human body. Bravo to knackered 37-year-old muscles and in particular to the stubborn streak that keeps legs turning when things feel lost. What’s most memorable about the ride? A few things. Mainly the climbs, not Alpine but steep, stubborn rakes that don’t seem to like you very much. Fleet Moss is home to Yorkshire’s highest road and provoked considerable argument from quads and calves. That I made it over without trouble lulled me into a false sense of security and I didn’t do what I saw others doing at the Hawes feed station: swilling energy drinks in a quest for electrolyte fuel. Somewhere outside Hawes a thick fog descended in my head. I pulled off the road for a stretch, trying to rid myself of increasingly painful cramp and trying not to panic. By the next climb – the Coal Road – I was gobsmacked to find myself pulling up with shooting pain, walking for a few metres, then falling off when trying to remount. I got going again, still at the base of the climb only with considerable dull-headed stubbornness, and have no recollection at all of the brief descent before Garsdale Head or that climb itself. The view down into the next valley was jaw-dropping enough to jolt me awake. I definitely got a kick out of the descent towards Ribblehead. Around here the fog clears and I went from counting each pedal revolution to feeling like I was a certain finisher. Just as well as I was only just over halfway at this point. I can’t really make sense of this section of the ride as it seemed to take place in my head. I was certainly glad to leave it behind. By the time we reached Settle I was bristling for a scrap with the steep hellingen I’d lost to on my last ride round here, and summitted noisily, yelling something that may have sounded like encouragement to those around me also puffing their way to the top. It was from here a small matter of getting back to Ilkley in a decent time. That I did, but the middle section wiped out the sense of joy I have had after other long rides. I was glad it was over, even if now I’m starting to feel some pride at making it both in the immediate circumstances and given the challenges of training for such a ride right now. As ever, at the finish fellow riders got stuck into beer and swapped stories, while I rode quietly away. I’m more certain than ever of the beauty of the Dales and that a bike is the best way to see them, and also have a funny feeling that I’m not done with the White Rose Classic.